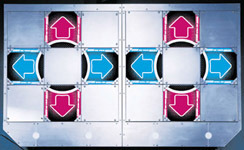 Dance Dance Revolution (DDR) conceptually is a very simple game. There is a platform with four arrows: up, down, left, and right. There are four stationary arrows at the top of the screen. There will be arrows that scroll up from the bottom of the screen. When the scrolling arrows overlap the stationary arrows, you then hit the corresponding arrow on the platform. And that's it! You have now learned the basics of DDR. DDR Freak has plenty of information for those who would like to learn more about DDR, or those who make it part of their lifestyle. To learn how to speak the language of DDR, consult the DDR Freak Dictionary. If you want help on how to improve, take a look at the Tips & Guides section. To hear a sampling of the music you'll find in DDR, tune in to DDR Freak Radio. Need to know where to find DDR? Search for arcades with DDR near you in our Machine Locations database, or shop for gear to help you groove at home. Now that you know what DDR is, get out there and show us what you're made of! 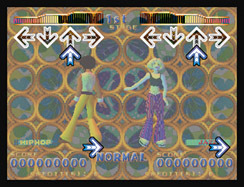 And when your legs begin to fail you, have a seat and come join us on the DDR Freak Forums.